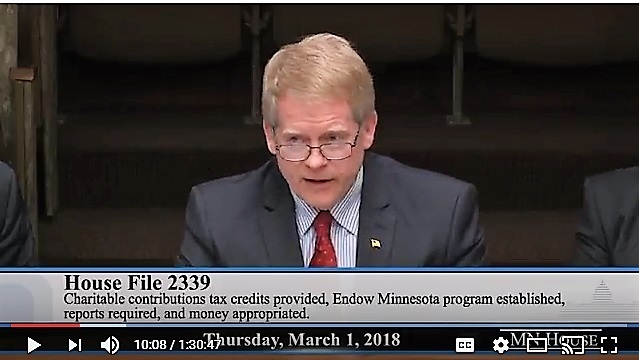 The Minnesota House Taxes Committee had a hearing on the Endow MN tax credit bill (HF2330). Endow MN is one of several proposals the committee is considering for inclusion in an omnibus tax bill as ways to counter the impact of federal tax changes on charitable giving in Minnesota. Chief author of the Endow MN bill in the House is Rep. Paul Rosenthal (DFL – 49B). (The bill has a bipartisan group of ten co-authors.) During the hearing, Rep. Rosenthal advocated for the bill as a way to take advantage of the unique, generational transfer of wealth occurring in Minnesota; estimated at $48.7 billion from 2011 through 2031. MCF members testified in support of the bill. Watch the hearing here. There is strong interest among members of the House Taxes Committee to promote charitable giving in Minnesota, and based on the questions and discussion following the testimony presented by MCF at the Endow MN hearing there Endow MN is considered to be an innovative idea deserving of further consideration. MCF is currently working with the bill’s Senate author, Sen. Jerry Relph (R-14) to get a hearing scheduled in the Senate Taxes Committee. In MCF’s analysis, passage of the Endow MN bill is primarily dependent on legislators hearing from community foundation staff, board members and donors. It is important to contact the legislators who represent you, as well as members of the House and Senate Taxes Committees. Contacting Governor Dayton can also be helpful. Learn more about Endow MN.